I think the journalist Angela Ward gets it right. Elderly residents at the Green House are blooming along with the flowers in their courtyard. The innovative nursing home, which opened in December, is designed to look and operate less like an institution and more like a home, said Debby Bravo, Green House guide. It is part of a spectrum of living options for elderly residents at Buckner Westminster Place, which also includes independent living, assisted living and memory care. 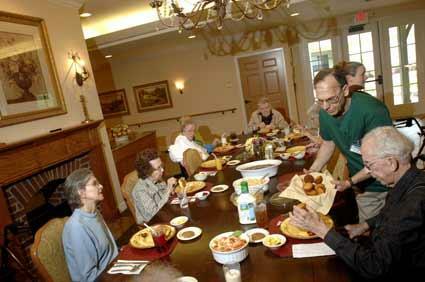 Farooq Bahadory, a staff member with the Green House at Buckner Westminster Place, hands out cornbread to the residents Monday at the Green House in Longview. Two homes are connected by a central courtyard. Both can house 10 residents, each of whom have a private room and bathroom. The rooms open onto a central living and dining area, with offices and laundry facilities in the back of the house. One house is completely filled; the other has five residents, with five more residents scheduled to move in this month. Residents of the homes range in age from 65 to 97. All have health problems severe enough to require skilled nursing care, Bravo said. James Smith, 88, admits his memory isn’t what it used to be, and that’s why he can no longer live independently.